As we heard in the first reading, “…the faithful shall abide with God in love….” Our dear Sister and friend, Elizabeth Ann Brown, surely is one of these faithful now enjoying God’s embrace. She told many of us during these last few years that she was waiting for God to “take her home.” And on November 24th God finally came. Those who attended the wake service last evening heard stories of Elizabeth Ann’s, prayerfulness, concern for others, sense of humor, unfailing kindness and special love for children and dogs. She was a friend to so many—ready to offer encouragement, a listening ear or a shoulder to cry on. Her devotion to St. Anthony and willingness to pray to him for anyone or anything that was lost were legendary. remained close to her nieces and nephews and their families, delighting in all their accomplishments and greatly enjoying their visits, phone calls and frequent cards and gifts. We welcome her nephew John, his wife Lee, her great nieces Kathy and Beth and her great nephew John who are here with us today. Elizabeth Ann graduated from Cathedral High School in New York in 1935 and went on to Grace Institute (of Business). After finishing her studies, she accepted a position as New Accounts Teller at Emigrant Savings Bank where she worked for eight years before entering the Grey Nuns of the Sacred Heart on September 8, 1944. Betty Brown joined the Grey Nuns with a dream of working in the orphanage in Ogdensburg. This dream did not materialize exactly as she imagined. Instead, she was sent to teach children in a variety of schools where she played a key role in the formative years of hundreds more than she could have encountered at the orphanage. Her 44 years in elementary education took her to multiple locations. She spent only one year near “home” at St. Leo’s School in Corona, NY but most of her early years were spent in Pennsylvania at Melrose Academy in Melrose Park, St. Canicus School in Mahanoy City and Mother of Divine Providence in King of Prussia. Her last 28 years in the schools were in the North Country of New York at Bishop Conroy School in Ogdensburg, then St. Mary’s School in Potsdam where she ministered for her last 25 years in education. Over the years she served as teacher, Principal, Superior and mentor to many fledgling teachers as well as to her students. Her dearest love was for the little ones in first or second grade and her specialty was teaching reading. Even while serving as Principal in Mother of Divine Providence with over 500 students in the school, she often went into the lower grades to help teach the children to read. Teaching religion was another of her talents. She had the wonderful gift of being able to make Our Lord come alive for the children. Jesus’ exclamation in today’s Gospel—“I praise you, Father…because you have hidden these things from the learned and the wise and revealed them to the little children” is one that would have resonated clearly in her heart. It was not only academics that Elizabeth Ann was interested in, however. She always sought out the lonely or troubled ones, finding ways to sooth their troubles and let them know they were welcomed and loved. She always extended a helping hand which often included offering an extra sandwich or cookies to heal the hurts or reconcile relationships. Her concern and helping hands reached out to parents, families and co-workers as often and as readily as to her students and she maintained strong bonds of friendship with many throughout the years. In addition to her teaching ministry, Elizabeth Ann was always known as a business woman and served in various roles as requested, such as house finance person, school administrator and even Treasurer General for one year. Once she retired from teaching—in her early 80s!—and began her retirement, she continued to reach out to others, serving in whatever capacity she could. Though her health and energy began to wane, her interest in and concern for others remained strong. Even at St. Joseph Manor she visited all the patients on her floor, keeping up with them and their families, and praying with them and for them. She was a good, caring neighbor to everyone, including the staff. For some time I have been thinking of entering the convent and have now decided to do so. I have inquired about a few Orders and I have come to the conclusion that I would like to join the Grey Nuns of the Sacred Heart. Would you please consider my application and if you decide to accept me, would you please let me know what I will have to do. No frills, no extra words, no self-consciousness. Just three sentences that said all that was needed. That was Elizabeth Ann. 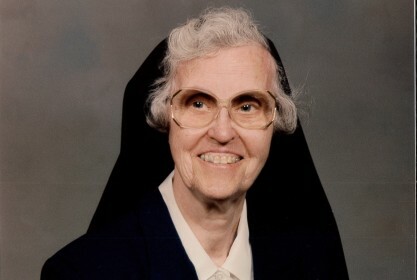 And thus began her journey into more than 70 years of religious life. Thank you, Sister Elizabeth Ann Brown, for the blessing you have been among us and for the care and generosity you showered on us all! Reflection delivered by Sister Julia C. Lanigan, GNSH, President Grey Nuns of the Sacred Heart at the Liturgy of Christian Burial on December 9 in Sacred Heart Chapel, Grey Nuns Motherhouse, Yardley. Arrangements by Beck-Givnish Funeral Homes, Inc. Contributions in her memory may be made to the Grey Nuns of the Sacred Heart, 1750 Quarry Road, Yardley, PA 19067-3998. Sister Elizabeth Ann Brown, GNSH, 98, died at St. Joseph Manor, Meadowbrook, PA on November 24, 2015 in the 72nd year of her religious life. Born October 8, 1917 in New York City, she was employed as a New Accounts Teller at the Emigrant Savings Bank in New York City for 8 years prior to entering the Grey Nuns of the Sacred Heart in 1944. She received her BS in Education from D’Youville College, Buffalo, NY. A lifelong educator, she taught in various areas of Pennsylvania and New York for 50 years. The majority of her ministry was spent in the primary grades, especially Grade 2, where she prepared hundreds of children for the reception of their First Communion. Sister Elizabeth Ann’s long teaching career began in Pennsylvania schools (twenty-one years), including Melrose Academy; St. Canicus, Mahanoy City and Mother of Divine Providence, King of Prussia. Sr. Elizabeth Ann was principal at Mother of Divine Providence for six of the thirteen years she was there.The second half of her ministry years were served in the North Country of New York State. Three years at Bishop Conroy in Ogdensburg (as Principal) were followed by 25 years at St. Mary’s in Potsdam. During her final year in Potsdam, she volunteered at the school where she taught for more than two decades. She also taught in Corona, New York. Respected and loved by pupils, parents, teachers and those with whom she came in contact, Sister Elizabeth Ann was named Teacher of the Year by the Diocese of Ogdensburg, NY in 1987. Retiring to the Motherhouse in Yardley in 1997, she continued in active volunteer service to her sisters and the community. Most precious to her was an increased time for prayer to occupy the days of this quiet, devoted and gentle woman. In 2008, failing health required her move to St. Joseph Manor where she resided until the time of her death. In addition to her congregation, she is survived by nieces and nephews and their families. knew she would want that….. I was one of Sister Elizabeth Ann’s second grade pupils at Melrose Academy in 1952. It has been 63 years since I was her pupil, but I still remember how gentle and caring she was. She was not only a good teacher, but she took a personal interest in each of us and our well being. She told my parents that I couldn’t see to read the black board. She was right ! I needed glasses. When I brought prescription eardrops to school she made sure that I got them on time. She watched over all of us like a second mother. I have never forgotten her goodness. God rest her soul.